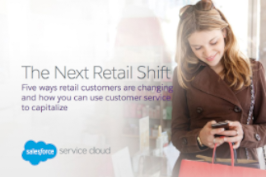 "The Next Retail Shift: Five Ways Retail Customers Are Changing and How You Can Use Customer Service to Capitalize." Want to know more about how Salesforce can bring your business closer to your customers? Call us at 1-800-NO-SOFTWARE.